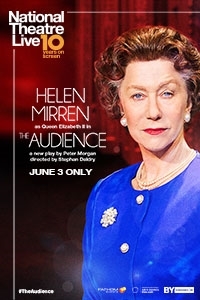 Academy Award®-winner Helen Mirren, plays Queen Elizabeth II in the Tony Award®-winning production of The Audience. Captured live from London's West End in 2013 in cinemas to mark National Theatre Live's 10th birthday - June 3 only. For 60 years, Queen Elizabeth II has met with each of her 12 prime ministers in a private weekly meeting. This meeting is known as The Audience. No one knows what they discuss, not even their spouses. From the old warrior Winston Churchill, to Iron Lady Margaret Thatcher and finally David Cameron, the Queen advises her prime ministers on all matters both public and personal. Through these private audiences, we see glimpses of the woman behind the crown and witness the moments that shaped a monarch.